Happy New Year friends! I'm so excited to kick off my first blog post of 2018 with Megan and Zack's wedding day from this past November. While it turned out to be an exceptionally cold day, you could barely feel it with the love between these two. While posing for portraits outside in 30 degree weather, I specifically recall Megan say "I'm so happy that I can't feel a thing!". Megan was stunning in a classic, elegant ballgown by Vera Wang, paired with adorable sparkly sneakers to keep her toes warm. 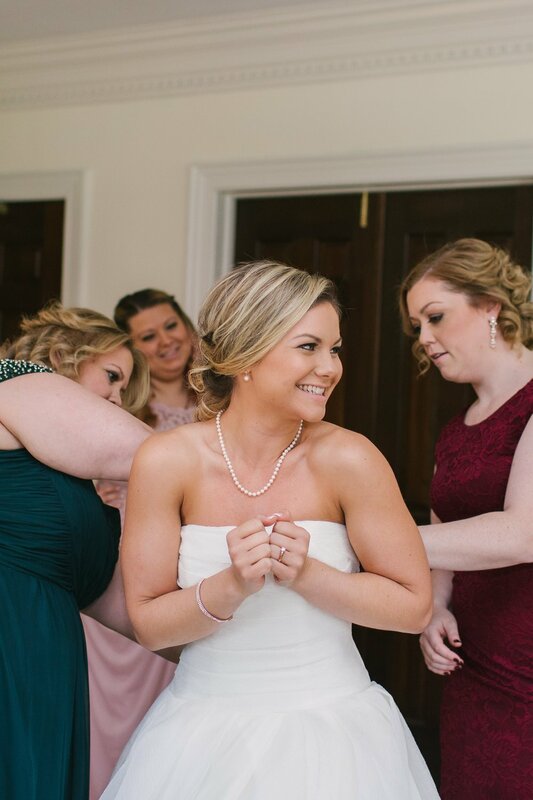 Keeping with tradition, Megan and Zack decided not to see each other prior to their ceremony, which was officiated by Zack's family pastor at Jackson Chapel in Frederick, Maryland. We pulled inspiration from seasonal autumn colors, the venue setting in Frederick's countryside, as well as their favorite flowers. Floral & Bloom designed gorgeous, textured bouquets consisting of soft, neutral tones and flowing silk ribbon for Megan and her bridesmaids. We pulled in pops of rich color with eggplant bouts for Zack and his groomsmen, and mixed into the low floral arrangements on guest tables. The other half of guest tables had elevated arrangements full of greenery and magnolia, adding warmth and texture to the pure white tent. One of my favorite details was the added greenery expertly installed on the tent's existing chandeliers by Floral & Bloom. A little addition that made such a big impact on the overall ambiance of the space! Check out some of the pretty details ahead captured by Rebecca Wilcher! View the full vendor team at the bottom of the post. Congratulations to Megan and Zack, it was a joy to be part of your big day!